Having a hard time choosing which book to read next? Not sure how you’re going to find those twelve books you need to get these awesome Summer Reading prizes? Or perhaps you think you’ve read everything, and that the library offers you no more new, exciting adventures. 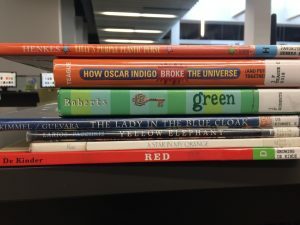 Look no further than “Experimental Reading.” Inspired by The Lonely Planet Guide to Experimental Travel, these “Experimental Reading” challenges offer young readers an off-beat way to explore the children’s section. Each challenge is designed with the aim of picking out a book you usually wouldn’t have. Maybe it will be your new favorite book! Or maybe you’ll hate it. But now you’ll know! This one is harder for some than others. My name’s Pete, and there’s literally an entire series based on a character with the same name as me (maybe you’ve heard of it). If there isn’t a book with your name in the title, try seeing if there’s a book written by someone with the same name as you. If this doesn’t work, see what comes up in our catalog when you type your name in a general "keyword" search. If that doesn’t pull up any results, simply consider the challenge conquered and move on to the next challenge. It is said that famed science fiction author Isaac Asimov is the only writer published in 9 of the 10 major categories of the Dewey Decimal System. I bet he never finished Summer Reading Program, though! For this challenge, knock out 10 of the 12 books you need to read for SRP by exploring the unique books each section offers, from books about crop circles (see 001.94 Burns J) to Greenland (see 998.2 Blasfie)! Bonus points for reading a book from the Reference and World Language sections. EXPERIMENTAL READING CHALLENGE #3: Pick a Book by Chance! Only works for nonfiction. Step 1. Get a deck of cards. Step 2. Draw a card. Write down the number. Put the card back in the deck and shuffle. Step 3. Repeat Step 2 until you have at least 4 numbers. Step 4. Put a decimal in front of the last number. And voila! You have a call number. It’s possible that there will be more than one book with that call number, and if there is, my suggestion is to just close your eyes and grab one off the shelf. Let chance guide you. Use the force. At that point, it is your only hope. They do not give many recommendations, but when they do they are usually stellar (spoiler: it’s always The Rainbow Fish). Parents, amirite!?!?! But maybe there’s something to all that guardianship stuff. There’s a reason the Parenting section is in the children’s department – there’s some interesting stuff in there! Explore it, and maybe soon enough you will turn into an older version of Boss Baby. Read a book that starts with the letter “A.” Then one that starts with “B.” Then “C.” And so on. Soon enough, you’ll have read…twenty six books! That’s a lot of books! And, of course, by reading all of the Rainbow Fairies books. Why? Because it was a great year! You were born! (And lucky you, 2012 – you get Let’s Go For a Drive!). Some highlights from 1991, my birth year: Chrysanthemum; Daddy’s Roommate; Strider; and Polar Bear, Polar Bear, What Do You Hear? Finished all the good books from your own birth year? Read the ones from your parents’ birth year, or your grandparents’! 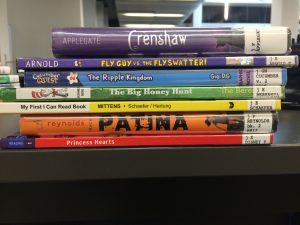 EXPERIMENTAL READING CHALLENGE #9: Read Every Book in the Library!!! For the bravest, boldest of hearts. Let me know how it goes. So there you are! Experimental Reading. Have an idea for another “Experimental Reading” challenge? Let me know! My name’s Pete, and I only read books whose titles start with "QA" (I haven’t read a lot this summer). Oh, and of course, if you ever just need a good old book recommendation, feel free to ask a librarian! We are happy to talk about books and happy to talk to you.